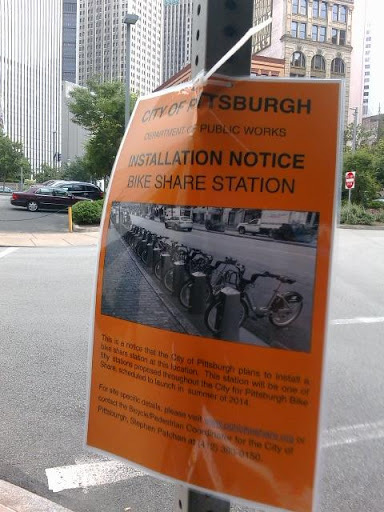 This is a notice that the City of Pittsburgh plans to install a bike share station at this location. This station will be one of fifty stations proposed throughout the City for Pittsburgh Bike Share, scheduled to launch in summer of 2014. For site specific details, please visit http://pghbikeshare.org or contact the Bicycle/Pedestrian Coordinator for the City of Pittsburgh, Stephen Patchan at (412) 393-0150. This topic was modified 5 years, 9 months ago by paulheckbert. Someone facebook-tagged me a picture of the same sign posted at Federal and Isabella, directly outside PNC Park. Bike share is coming IF we get enough sponsorship money to launch it and operate the system. If you work for a major local corporation and have an “in” with the executives, tell them they should support this and sponsor it. We’re pitching corporations right now. This is not a 100% done deal as it stands today. Posting the station locations is part of the public outreach strategy so to avoid a lot of the negative stuff that happened the first week of the launch in NYC with people there saying they had no idea that it was coming or what the stations would look like. The bike share team is trying to give plenty of advance notice that this is in the works. Seems like the perfect opportunity for our non-profit overlords UPMC to ante up. By the way, you will probably want to call and/or email your councilperson and the mayor’s office to tell them how excited you are for bike share to be coming to Pittsburgh. They are only hearing from “irate” callers who don’t want it right now. What? I don’t remember any “maybes” in the bike share press conference a few months ago, it sounded like a done deal. It’s not a done deal. Everyone speaking said we needed corporate support. Read the articles in the paper that followed. The press conference announced that we got federal funding, were heading into the public process. Well, the situation is what it is, but up until today I was under the impression it was definitely going to happen (even the article you linked to uses the word “will” everywhere but the headline) and we didn’t have to do much but sit back and wait. Now it sounds like there’s some doubt about it and people should be taking some action – which is unfortunate, but good to know. BTW, I finally took my first ride on a BkSq bike yesterday. I know those aren’t necessarily the same bikes for the citywide system, but I thought it was decent – although if it were up to me I’d swap the 3 speed hub for 7 (Shimano does make a 7sp roller brake version). No action needs to be taken other than by corporations, whom we’re meeting with every week. Well, if you’d like to call or email councilpeople and tell them you support it, that would be terrific, but they all voted for it back in March. We have a new nonprofit set up to operate it, a business plan, a location plan, the local match of $400k for $1.6M in federal funding (not to mention political will). We’ve raised $2M to purchase the equipment but that’s not what the system costs to launch and operate. I am very very confident that a corporation will step up to the plate and take advantage of this product that will give them much more value in branding than what we are asking, but as of today one hasn’t. This sponsorship money is built into our business plan, however, so without it we won’t have the revenue to run it. Per our timeline with the state and Feds, we have another 8 or 9 months to get a sponsor. 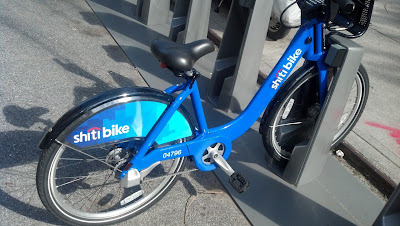 basically, if i’m reading correctly, we’re just looking for someone to be the ‘Citi’ in our ‘CitiBike’ … ? @scott…out of curiosity, are any of the Universities with downtown student populations stepping up? (Duquesne, Art Institute, Point Park)? Seems like an asset that would benefit them, too. We are definitely keeping the large institutions on our radar, but we’re not approaching them first since none of them would want to underwrite the entire system. Selling off the naming rights to individual stations is an option, though. When I previously went out there in March, this street space was parking spots. Now they’ve gone the Park-ing Day Route, put a wooden deck down, and turned the car parking into bike share parking. I thought it was fantastic. But what was doubling amazing for me was: What does the owner of the retail shop that lost these two parking spaces in front of the business think about this? What I found surprising was: the business is a bike shop, and they don’t see any conflict at all with half-hour-free bikes, or short-term-cheap bikes right in their doorway. They see it as enhancing their business, not detracting from their business. I thought that was pretty enlightened. Imagine, for instance, a car dealership embracing Zip-Car parking. Is this true? Do some stations remain open or does the whole system shut down? rsprake wrote:Highmark or UPMC should sponsor? A) Highmark AND Upmc should sponsor, equally. B) How do setups like these work in four-season places where they are ubiquitous, like Paris? Certainly it snows in Paris. Do they shut the whole thing down there five months out of the year? I can see them taking a bunch of them out of service during low-demand months, but even in the dead of winter, we get those marvelous days when everything’s nice and clear, and there might just be some demand. Whatever they’re doing, let’s try a few here that way, too. But let’s get them in here at all, first. Will they fight over sponsorship too? StuInMcCandless wrote:How do setups like these work in four-season places where they are ubiquitous, like Paris? 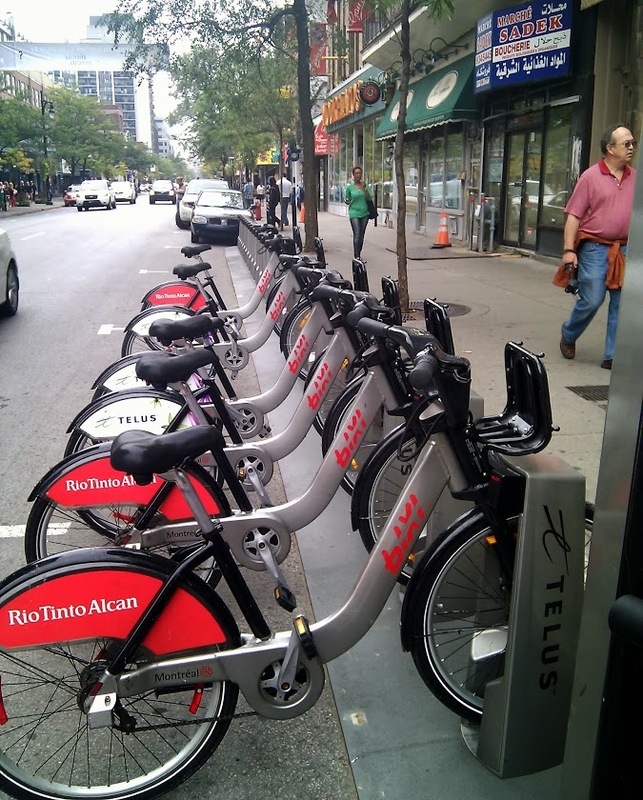 The BIXI bike-share system in Montreal is 3-season. They put them away for the winter. I don’t know how well you can see it in the pic, but the stands are attached to a plate, and the whole thing is in the street. Trust me, Montreal is not the place for winter cycling. Argh. Post apparently got eaten by the trolls under the messageboard bridge… Suffice it to say that while numerous bikeshare systems, including Montreal, Boston, Kazan, and Warsaw close during the winter, there are a bunch of others that stay open all year, including Boulder and Denver, CO; Washington, DC (hey, it does occasionally snow there); Columbus, OH… and pretty much the entire Swiss national share system. Pittsburgh City Council held a bill today that would have advanced the city’s bike-sharing project after council members expressed frustrations that their districts were being left out of the project. The stations — which were cut from a proposed to 100 to 50 after the project lost out on some federal grant money — are primarily located in the East End, Oakland and Lawrenceville and along corridors between those neighborhoods and Downtown. But there are none proposed for Mount Washington, the South Hills or Squirrel Hill and the proposed station that sits the furthest east is at Bakery Square. “We deserve more than we’re getting,” said Councilwoman Theresa Kail-Smith, who represents Mount Washington. Her district, along with those of council members Corey O’Connor and Natalia Rudiak, are not included in first-phase plans for the stations. With only limited money available, I think it’s reasonable that neighborhoods like Mt Washington and Allentown aren’t included. Few enough people ride up those hills as it is: how many would be doing so on bike-share wheels? The viability of the system decreases the farther away the stations are from each other, and with only 50, they need to be pretty close. Note how SH is not connected. The South Hills are really not that bad to ride around in once you get other there. I strongly agree that they need a safe connection to downtown more than they need bike share. But I can see bike share being useful out there, too. Yeah, I’d love to see this in squirrel hill. However, I don’t see it being viable to remove other stations to make this happen. Squirrel hill, Highland Park, Point breeze, East Liberty, Casino, Manchester, and Mexican war streets could also benefit a lot from this as part of a later expansion along with increasing density in existing neighborhoods. However, I think it’s important to build a strong core system and then work on securing funding to expand it outward is the only way to make this work with the funding we have. If it is spread it too thin then it doesn’t serve it’s purpose. The south hills almost needs a separate system or one that relies very little on circulation between here and lower neighborhoods. These bikes are not great hill climbers, and the inclines are preserved more as historical artifacts than as functional transit (though they do serve this purpose somewhat even now). I’d love to have the inclines be rebuilt using modern technology with more space to accommodate bikes and more passengers. The one in johnstown, while still pretty old, can even carry cars, bikes, and motorcycles up the mountain. Ted wrote:With only limited money available, I think it’s reasonable that neighborhoods like Mt Washington and Allentown aren’t included. Few enough people ride up those hills as it is: how many would be doing so on bike-share wheels? I agree that these areas are probably a phase-2 expansion. But I think Kail-Smith and Rudiak’s point is that the South and West Hills get left out of, well, just about everything, and there are a lot of people out there who would love to be included in programs like this if anyone would try. Where were they in advocating for bike lanes on west carson st? Seems like if one was a resident in any of the above-mentioned districts, now would be a good time to clarify that as a voter, one supports bike share taking into account the concerns being brought up. I wonder how many people there are that would attack any of Pittsburgh’s hillier sections but don’t already own a bike. I enjoyed the three speed cruisers in Tel Aviv but I would not want to use them around here. The point isn’t whether people can ride bikes on Mount Washington, or to Mount Washington (or any other neighborhood), it’s whether a sufficient number of people would use the bike share system to make it worth installing stations. The reason the system is focused on the downtown area is because that’s where the density of people is, with lots of potential destinations. It seems like a nice idea to have a bike share station in each neighborhood, but most of them wouldn’t get a ton of use and would take away from building a really good system in the center of the city. Bike Share should be available in areas where people need short-distance transit. This is a service not for bike-geeks (who already have bikes) but for people who need to get around. It is not primarily a commuter solution. The issue with Mt. Washington is not whether people will or won’t travel between there and downtown but whether people there could use share bikes to get around Mt. Wash / Allentown / Beltzhoover / Mt. Oliver. Asymmetric/dynamic charging can deal with use patterns (e.g. free minutes if you take a bike up to Mt.Wash, extra charge if you take it down the hill). Squirrel Hill is pretty compact; it should also work there (say for Oakland). Velib in Paris does something like this. In any case, since it’s Pittsburgh, why couldn’t we simply get (say) 7-speed hubs? It passed today, though Kail-Smith and Rudiak abstained (as did Harris, though her reasons are unstated). Interesting, sounds almost exactly like THE ENTIRE REST OF OUR TRANSPORTATION INFRASTRUCTURE.